I'm very inexperienced with cannons. I've built a couple combustion cannons before, the biggest being 6 ft tall (ended up I built it out of DWV but it still worked ) I decided to step up the game though and get more technical. 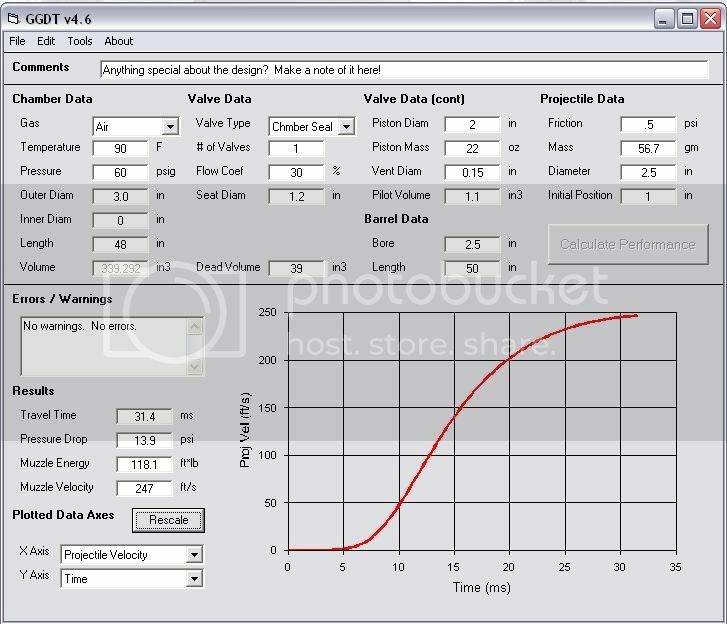 I have questions on valve specifications for use in GGDT and ratios. How do I find the spec on this valve to input into GGDT. I ordered a new valve because the old one didn't seem to fit my new design and I doubt the spudtech website will send info on their sprinkler valve with my purchase. With that drawing the barrel could be much longer also the sprinkler valve should be just before the barrel instead of being just after the chamber because there would be dead space. but othyer than that it looks allright! Any reason to use 2 T joints? Extra fittings are needed to plug the two extra openings. A pair of elbows would be better. Some consideration should be given to the air space between the valve and the tennis ball. Spudders refer to this space as dead space. When the valve opens some of your air energy is lost simply compressing this space to a higher pressure instead of the high chamber pressure being directly applied to the tennis ball. 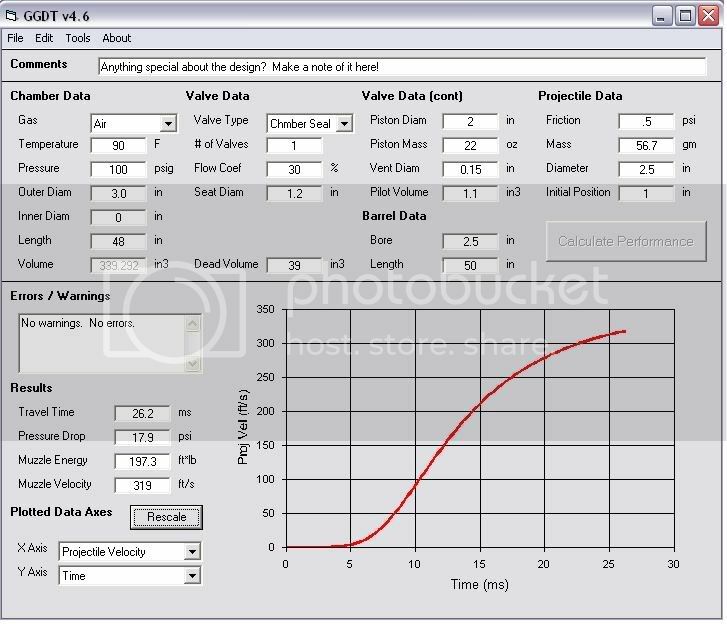 For the flow of the valve itself, the valve size needs to be known. Is it 3/4 inch, 1 inch, or 1.5 inch? http://www.thehalls-in-bfe.com/GGDT/ Then go into the design library and look up the specs on the orbit sprinkler valves. Rainbird should have similar performance. A quick electrical note on the recommendation on providing power to operate the valve. DC will provide higher current in an inductive load (coil) than AC. The valves are 24 volts AC and work fine on 12 volts DC. Use a maximum of 2 9 volt batteries in series, not 3. One may operate it just fine. Try it. That is not too bad. To get an idea of the effect of re-locating the valve to just behind the ball, move the dead space volume into the chamber and use a smaller dead space such as 6 cu in to accommodate the space behind the ball between it and the valve seat. See if that works better. 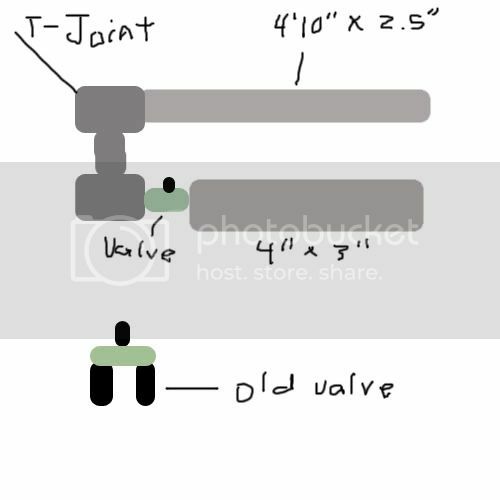 I understand the valve location as the overall length is shorter with the valve length inline with the short chamber instead of the long barrel. It may be worth considering a trade off of overall compact size vs performance. Air flow restrictions make huge changes in performance. Even an inline may be worth considering to eliminate the two extra bends in the air flow path. GGDT doesn't yet factor the loss in flow due to each added elbow in the flow path so seeing the degradation in GGDT is not possible with your existing bends between the valve and projectile. Your performance will be a little less than the GGDT model shows. That's a good point you bring up. I tend to over think things and went for something with more bends. I assume by an "inline" you me an entire cannon that is joined tip to tail to create a line? But portability is a must. I have a Volkswagen Jetta so hauling this 4ft 10in cannon is going to be hard enough. I'll do some GGDT manipulation to see if I can get similar results with a shorter cannon though. Heck, maybe I could make 2 with all the spare parts if its small enough. Thanks for the idea!